Humans are like snowflakes – no two are exactly the same. Since each human being is different in nature, we all have different needs. The problems a growing number of people run into when selecting their mattress is that they really don’t consider bedding that was specifically designed for their bodies and instead only consider mattresses that were designed to appeal to the mass markets. But this is a huge mistake because it can lead to lower quality sleep as a result of a lower quality mattress construction. Believe it or not, your bed has the ability to affect your entire life because we spend roughly a third of our lives sleeping. If you have a big & tall body type, consider the following reasons why a Medicoil HD Mattress is critical to getting quality sleep. Due to mass marketing by brand name mattresses many people have been advertised too and suffer from the delusion that beds found in furniture and mattress stores will fit any and all body types. Not true, while they may fit the mattress the systems usually won’t hold up. People who are XL and have the need for a heavy duty sleep surface know differently, but there is more to a bed than its physical dimensions. People of varying weights need to consider the thickness of their mattress as well as its firmness like everyone also, but also must be sure that the mattress includes super strong foam and upholstery, more total steel than the average mattress, and the most stable foundation for optimal support and comfort . Trying to rest on a bed produced for the mass market won’t do you any favors and rarely gives you one of those features much less all of them as it wasn’t designed to support your unique body. If you have health problems such as back pain, arthritis, joint pain, or you are recovering from an injury, you are going to need plenty of space. Health problems can amplify your discomfort if you don’t have an HD bed, and depending on your injury or health issue, you will likely need to position your body just right to mitigate the pain. 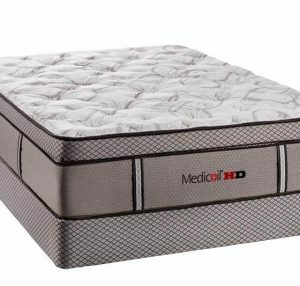 Without an HD Medicoil Mattress, this can be extremely challenging. But not only will your sleep suffer without room to spread out, the quality of your partner’s sleep will also diminish. An HD bed is critical if you have recently had bariatric surgery to reduce your body weight, too. For this body type, an HD bed is really the only viable option on the market to get quality sleep. If you sleep in a bed every night that wasn’t designed for your body, you’re not going to get quality sleep. A bed that is too tiny for your body will feel too small and make you feel like you don’t have enough room to get your beauty rest. What’s worse is that you will feel even more cramped and hungry for space if you share your bed with a significant other. Though you may not realize it, the state of your mind before you enter a deep sleep has a huge bearing on the quality of your rest. If you go to bed with claustrophobic thoughts, you may feel too constricted to get adequate rest. If you have a big & tall or sometimes called plus size body type, you need to consider a heavy duty bed. Trying to get by with a bed that is too small and ill-equipped to meet the size and weight needs of your body can disrupt your circadian rhythm, throw your life out of balance, and negatively affect other aspects of your life. Your bed is central to your life, and you need to make sure that your bed was designed for your unique body to allow your body to rest and recuperate from the demands of your busy day.